Are you looking for an IKEA Armchair but not sure which will be the one and the best for you? Ideally this is kind of an armchair that is comfortable enough when you want some alone time at the corner of the living room or enjoying your evening in the backyard of your home. The chair that does not let you powernap for way too long, and will allow you to get back to your laptop or other devices right away. You are in midst of a long-term commitment and like everyone of us know that you will not want to settle for anything less than perfect. You want the armchair to be aesthetically pleasing, affordable and as durable as possible. In this review we will describe my experience with this stylish, comfortable, easy-to-move, and space-saving chair. The name product is Ikea Poang Armchair with Cushion, Cover, and Frame. Let we begin the review! The look of this chair can make you sort of an impulse buy. Like a lot of Ikea furnitures, it has a unique but attractive style. It is also made up of an S-shaped wooden frame with a chair cushion on top. There is also a smaller cushion for your head which is attached to the back part of the armchair cushion. This chair comes in a very wide range of woods and armchair fabrics, which must make it quite easy to math most decors. You will feel easy to relax into this chair as it tilts backwards. The customers can get well-supported especially those witg upper-back problems. Because the back of the chair is not directly connected to the floor you get the feeling of being slightly suspended, and this gives the base of the chair enough flexibility to allow you to gently rock.Despite its flexibility this chair is surprisingly strong, and its strength is tested again and again in your household. This chair is so comfortable. I absolutely love the color. The contouring of the back fits nicely even when you sit in this chair for work at least 6 hours per day and do not have discomfort.The cover shrank a bit despite having followed washing instructions. This caused the foam to bend a bit which does look a bit funny but doesn’t compromise comfort. It is really difficult to take the cover on and off . Pair this with the fact that it shrinks but we are not sure how much it’ll get washed now which was the whole point. Overall, no complaints. Holds my weight well and my guys and he’s heavy @ 250lb, chair has no issues. · 10-year limited warrranty. Read about the terms in the limited warranty brochure. · Frame: Molded layer-glued wood veneer with surface of, Stain, Clear acrylic lacquer. · Frame of layer-glued, bent beechwood provides high flexibility and comfort. · High back provides great support for your neck. · Easy to keep clean with a removable,machine washable cover. 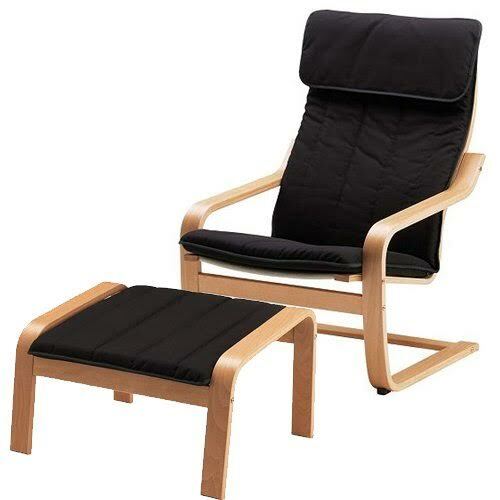 Check the best price for Ikea Poang Chair here!